This massive array of gourmet goodies will elicit rave reviews along with a few "...but it's too pretty to open" responses. As our one of our most popular gift baskets, "Holiday Splendor" is perfect for a large family, an entire office or one very lucky (and hungry) individual! Gourmet Holiday Gift Baskets like this one are hard to find. 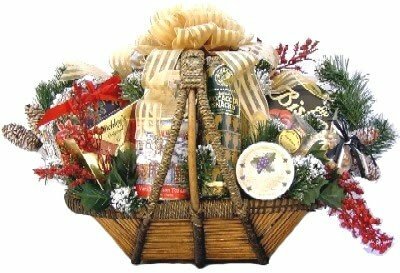 This jumbo gourmet gift basket is sure to leave a lasting impression and make yours the gift that gets remembered. This unique, oversized, holiday gift basket is adorned with boughs of pine, pine cones, bright red berries and golden ribbon. Wow, are you feeling a little bit hungry too?